In the name of full disclosure, I must admit that explaining a concept like Thanksgiving to my two toddlers kind of makes me want to pull all my hair out, strand by strand. But I know that as a parent, it’s my job to teach them these things. Things like thankfulness, appreciation for all that we have, the value of hard work and having a family to love, not to mention a bit about our country’s colorful history. Because while the big turkey dinner is an integral part of our modern day celebrations, there’s so much more to be gleaned from this day. And when all else fails, there’s always A Charlie Brown Thanksgiving! Teaching Toddlers to Give Thanks: Here are three simple Thanksgiving crafts to kick start the conversation with your toddler. Here’s how you do it: have your child color the placemat any way she chooses. Then you can laminate it and use it for Thanksgiving dinner. These would be perfect for “dressing up” the kiddos’ table. While she colors, explain to her that we are making placemats for a special family meal. Tell her that a special meal is a wonderful thing to share with people whom we love and appreciate. Tell her that a special meal calls for some special decorations, and that’s why we’re making these placemats. We want our table to look it’s best for our family and friends. 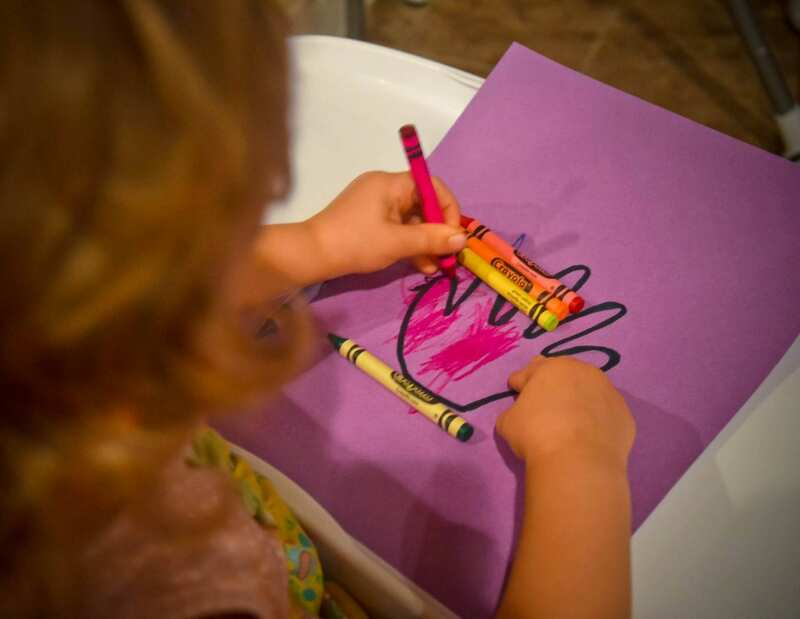 Here’s how you do it: trace your child’s hand onto the construction paper or poster board using a pencil. Feel free to outline the hand print in marker. Then allow him to fill in the “turkey” any way he wants. Help him add eyes, legs, wings — anything he’d like using a marker. Cut out the turkey and place him in a prominent position in your home. Every time your toddler points out the turkey, remind him that he made the turkey for Thanksgiving. Ask him to share something for which he is thankful. This will probably turn into a game. You know how toddlers love repetition! Here’s how you do it: trace the feather stencil onto the sheets of scrapbook paper. You can do all the same color, or mix it up with different patterns and prints. If you’re really feeling patient, allow your toddler to choose and help you trace. Cut out the feathers, and glue them to the headband (a strip of construction paper that goes around the top of her head). This is a great time to talk to her about the pilgrims that came to America for religious freedom, and their Native American friends that they made here. Tell her the pilgrims and the Native Americans shared the very first Thanksgiving together, and that’s why we celebrate every year. This is a great time to break out the Charlie Brown, if you ask me! What are some other practical ways you can share the message of Thanksgiving with your toddlers? We’d love to hear your thoughts!